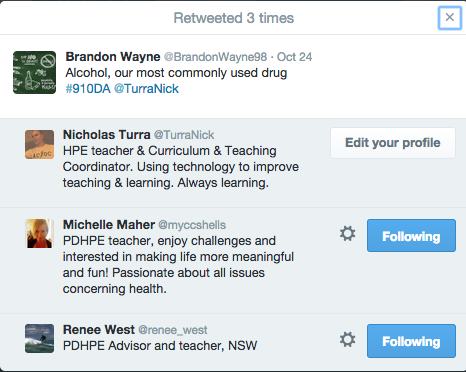 I have been using Twitter professionally for 3 years and acknowledge it as a major cornerstone of my professional development and a source for the majority of information shared on this blog. So having seen its benefits professionally I wondered how it would transfer into my 9/10 health class which is doing a drugs and alcohol unit this term. I am always conscious of not using technology because it’s all the rage or it’s what everyone else is doing until I have convinced myself of how it will improve student learning. Having said this sometimes it is hard to tell if the benefits will be realised without trialling it first. This is were I am at with using Twitter in my classroom. 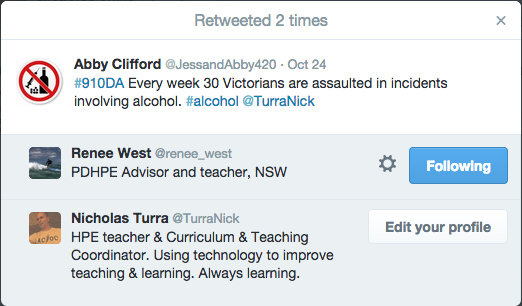 It will expose students to a broader range of opinion on the topic of drugs and alcohol. It will allow students to share quality information about the responsible use of drugs and alcohol including personal opinion and the latest data and facts. 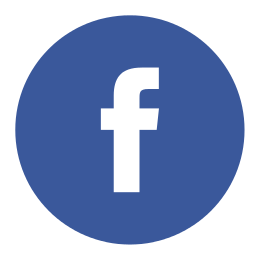 It will expose students to a new way of viewing social media. As a tool that can be used to develop professional and educational networks. It will be an opportunity to discuss responsible use of social media and how what you post represents you as a person. How do you want to be viewed? 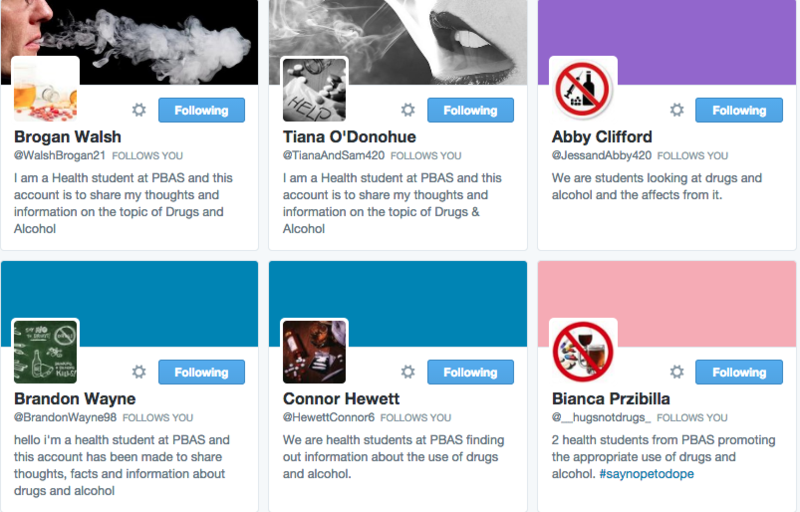 As part of setting up their accounts students had to follow each other and follow 16 organisations (selected by me) whose sole purpose was focused on the topic of drugs and alcohol, for example @DrinkWiseAust @ActiononAlcohol. We also created a class hashtag to allow us a way of seeing all of our tweets in one place, #910DA. It will be interesting at the end of this unit to see if Twitter met my expectations in the classroom and what the students thought of it as a way of learning. Below are screen shots from student accounts from our first lesson using Twitter. The first image shows 6 student accounts. Most students created their accounts in pairs using the first name of one student and the last name of the other. All accounts required a “bio” explaining the purpose of their account. 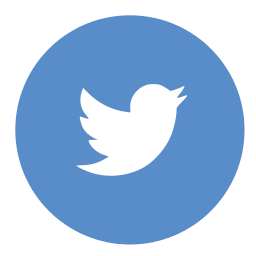 I retweeted all student tweets to my followers asking if they could follow, retweet or favourite some of my students tweets to help show them how Twitter works. I also thought it would give the students a buzz knowing that others were instantly viewing and sharing what they posted. 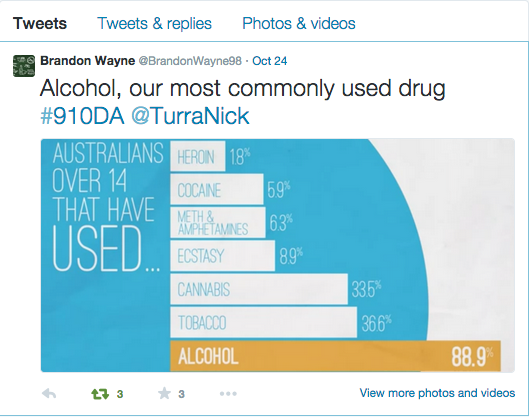 The tweet below was from Brandon and contained a graphic which can be seen a bit further down. Brandon’s tweet was retweeted by myself and two others sending it out to over 1500 people. One of our focuses is medical marijuana and its legalisation in Australia. 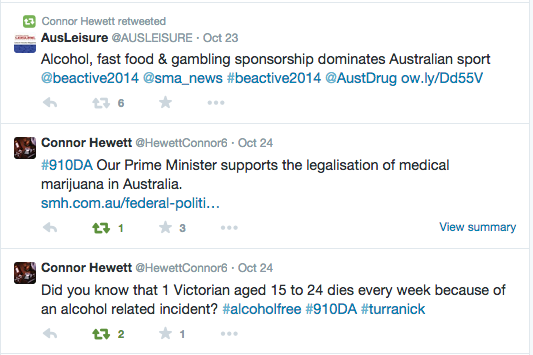 Both Connor and Maddy found that our Prime Minister Tony Abbot is in favour of legalising medical marijuana! It will be interesting to see what the students think after viewing the SBS program INSIGHT around this topic. This entry was posted in Health & Physical Education, Pedagogy, Technology, What's happening in classrooms? and tagged drugs and alcohol, health, twitter.